We had a great time visiting Diane and her kids this last week. Landon and Cooper loved playing together and loved that they had matching shirts! We went to the park, storytime at the library and played at their house. My girls got to watch Kaylin crawl all over the place and hopefully inspired them to start crawling soon. We had fun putting the girls in the pool and filling it with balls, they had fun picking them up and trying to chew on them. It was a fun three days, but a bit chaotic with 6 kids in the house! They all enjoyed it though and Landon can't wait to go back! On Easter Sunday our church had a professional photographer set up in the lobby taking family pictures for Easter. Just on the way to church we were talking about going to the mall after church and getting family pictures taken since we don't have any yet- well this saved us a trip to the mall and a whole lot of money! 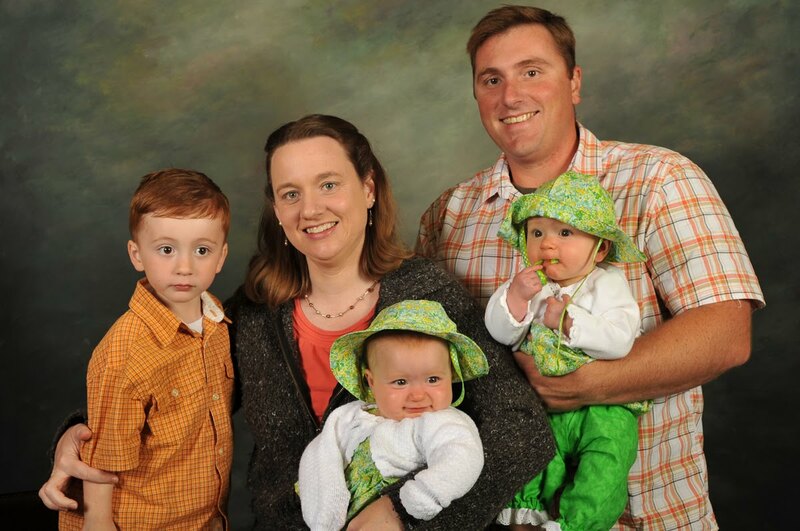 They gave us a 4x6 picture right then and then put the pictures on the church website for us to do what we wish with! Grandma Scharf made the girls these super cute Easter outfits, complete with bloomers, dresses, hats and bunny shoes! Landon had a blast finding eggs in our backyard after church! Saturday morning we went up to the Lake Done Pedro Easter egg hunt. It was freezing cold outside, but Landon had a lot of fun! They had a beanban toss game, a ring toss, a coloring table, and two crafts. Then they did hunts for various age groups. Landon was in the 3 and under group and was so good with the little ones. He helped some of them find eggs and was very cautious about not taking eggs that someone else was going for. I was very proud of him! Landon loved coloring Easter eggs this year! He quickly decided it was easier to just dunk the eggs in the colors with his fingers instead of using the metal holder! Needless to say his fingers were black by the end of it all. He is getting so grown up and I love to watch his excitement as he discovers new things. We did a lot of color mixing with this project and learned which colors to mix to get other colors! Very fun evening, the girls even joined the fun by sitting in their highchairs and watching big brother!